Hintons is a homeware and gift store based in Dorset and they've recently revamped their website so that people all over the country can browse and order from their range; having taken a virtual tour of Hintons' website, I think their stores would be just my kind of place with lots of kitchen goodies and fun games and gifts. Hintons wanted to give us a taste of their range of bakery items because they knew that Lara and Holly love spending time in the kitchen. 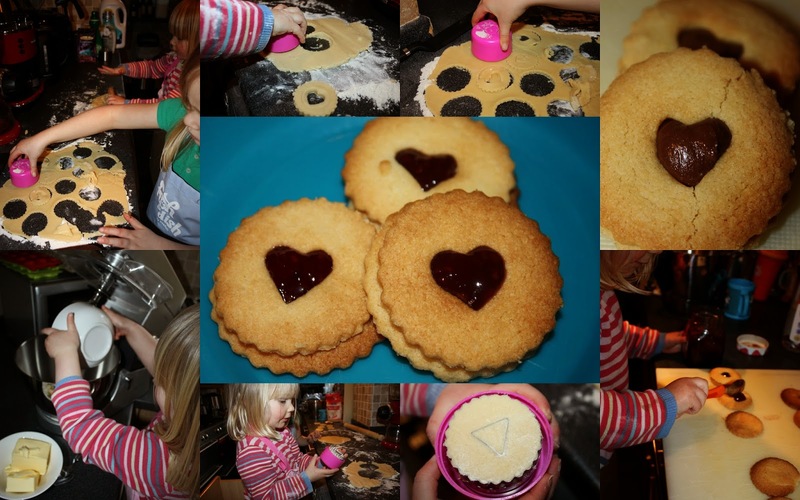 Last weekend, Holly, Lara and I made homemade jammie dodgers for the first time ever with a very handy gadget from Hintons. Our jammie dodger cutter was very popular with both Lara and Holly who were unstoppable when it came to punching little biscuit shapes. The cutter comes with 8 different shapes of inserts including all of the playing card shapes. We chose some valentine's themed jammie dodgers (and, for Lara, who won't eat jam, we invented choccie dodgers filled with Nutella). I thought this gadget was great fun... until I had to clean it. It is dishwasher safe but took a fair few trips through the machine in order to come clean! Today, Holly and I baked again. Holly tends to help me in the kitchen three or four times a week at present (it isn't all baking!) and today she wanted to make cakes. Inspired by The Great Comic Relief Bake Off this week, we made marbled cupcakes in these decorative cupcake cases from Hintons. Baking with Holly is never an exact science and I've learned not to stress if she wants to chuck everything into a bowl in one go...or mix the cake mixture for 30 minutes... or put ALL of the mixture into one cupcake. It really doesn't matter, so long as Holly is enjoying herself. Holly swirled vanilla cake mix with chocolate cake mix and topped them off with a thick chocolate icing and some rapunzel cake toppers (as you do). Holly simply couldn't wait for the icing to set. Which was a bit of an issue. Because it meant that post-cake she looked a bit like this. You can find Hintons online at hintonshome.com or on Facebook. 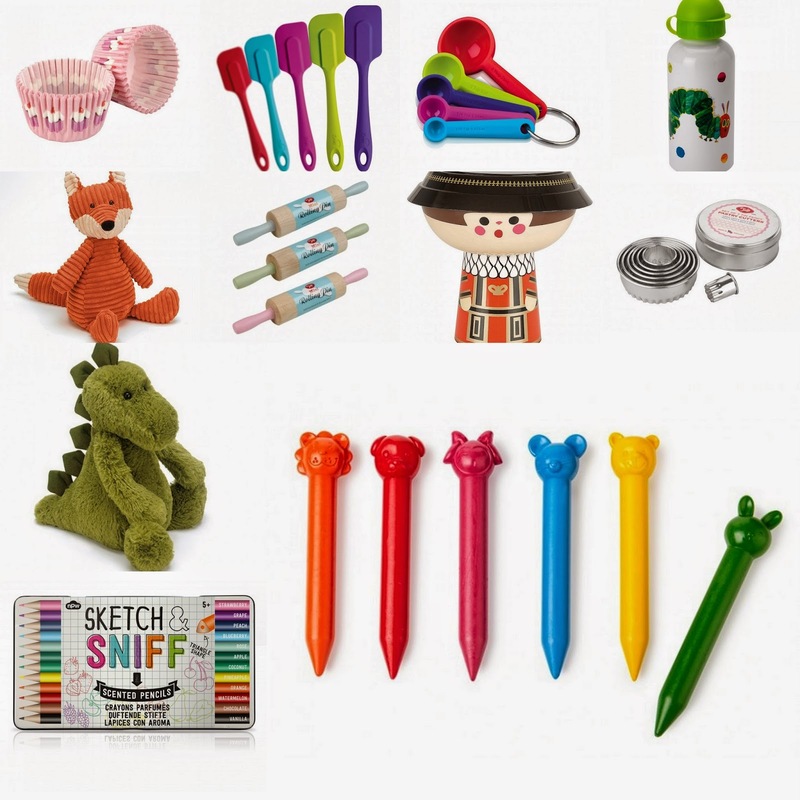 I've picked out a few of my favourite items from their range for cooking accessories or gifts for children; the full range can be found at Hintons Home Childrens Kitchen.